June 02, 2014, 1:26 p.m.
A recent essay in Atlantic Monthly by Ta-Nehisi Coates entitled &apos;The Case for Reparations&apos; has once again reignited the debate over the continuing legacy of slavery, Jim Crow and racial discrimination in the United States. The core of his argument is that after centuries of slavery, followed by decades of brutal oppression in the South and callous discrimination in the North, black Americans&apos; continuing poverty is a result of America deliberately frustrating the efforts of black Americans to accumulate and retain wealth until the 1980s. He follows that up by stating that if America is to ever resolve the racial problems that even now so characterize American society, a debt has to be paid and black Americans have to receive some sort of compensation for the racial "plunder" of their labor and deserved wealth. Unsurprisingly, this argument has been highly controversial. Opposition to reparations has been widespread, asking why people who had nothing to do with either slavery or Jim Crow should pay compensation to people whose ancestors were victims, or even if reparations would help to resolve the continuing troubles of America&apos;s black community. Even critics of Coates and reparations note, however, that he has forcefully demonstrated that the "systematic political and economic repression of black Americans" continued well into the 1970s. 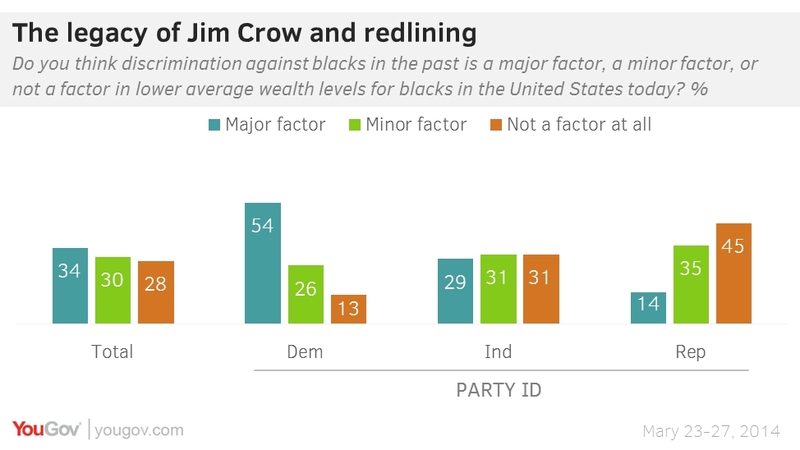 The latest research from YouGov shows that there is a significant divide, along both racial and political lines, on whether or not the lower wealth of black Americans today is a result of the lingering effects of slavery and discrimination. Most white Americans (51%) say that slavery is &apos;not a factor at all&apos; in the lower average wealth of black Americans, something only 14% of black Americans agree with. Among black Americans attitudes are turned on their head, with 48% saying that slavery is a &apos;major factor&apos; in their lower wealth levels today, something only 14% of white Americans agree with. Coates argues that the appropriation of black American wealth did not stop with the end of slavery; in the South it was commonplace for the land and property of black Americans to be siezed illegally, while in the North blacks were systematically prevented from buying their own homes and were penned into inner-city ghettos, a practice known as &apos;redlining&apos;. 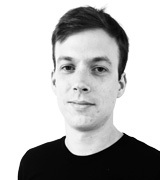 On this issue there is a significant political divide as well as a racial one. Most Democrats (54%) say that these more recent examples of discrimination are a &apos;major factor&apos; in lower average wealth levels for black Americans, something only 14% of Republicans agree with. Overall most Americans - including 61% of whites - say that the discrimination of the 20th century is a factor in continued lower wealth. Racial divisions become even greater when the issue of reparations is brought up. Only 6% of white Americans support cash payments to the descendants of slaves, compared to 59% of black Americans. Similarly, only 19% of whites - and 63% of blacks - support special education and job training programs for the descendants of slaves. Opposition to reparations for the descendants of slaves is overwhelming, with 68% of the public against it and only 15% in favor. 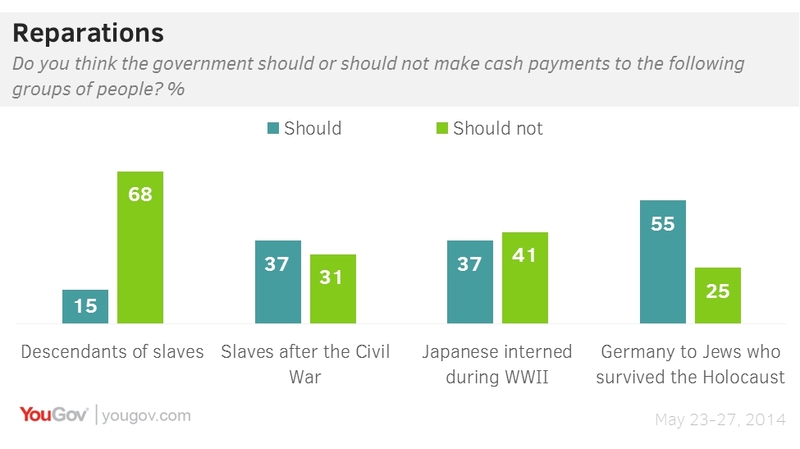 Asked in a separate survey whether the slaves themselves should have received compensation after the Civil War, 37% of the American public said yes but 31% said no. People narrowly oppose the Reagan-era reparations to Japanese-Americans who were interned during World War Two and the only example of majority support for cash reparations is Germany&apos;s payments to survivors of the Holocaust.